The simple addition of some oregano and lemon transform this chicken, and gives it a great Greek flavour. Add a topping of tapenade—a briny, punchy paste made with green olives. For a simple, flavourful side, you'll serve your pasta with some crunchy green beans, asparagus and smooth fetta - Delish! Preheat oven to 180°C. Bring a pot of salted water to the boil. Pat dry chicken with paper towel and place in an ovenproof dish. Sprinkle over oregano. Season with salt, pepper and a little olive oil. Cook in the oven for 20 - 25 minutes. Top and tail the green beans and cut in half. Cut woody ends off the asparagus (discarding ends) and cut into 3 cm pieces. When the water is boiling, add the risoni and cook 7 - 9 minutes, or until al dente (still slightly firm to the bite). After 3 minutes, add the green beans and asparagus. Once cooked to your liking, drain pasta and greens thoroughly and return to the pot. Drizzle with a little olive oil (to prevent sticking together) and cover to keep warm. (NOTE: We had a suggestion from a customer to add in some more greens on this recipe, so we listened. That's why you don't see any asparagus in the pic 😉 ). Zest the lemon, reserve lemon for dressing the cooked chicken. Finely chop the olives. Peel and finely chop the garlic; using the flat side of your knife, smash until it resembles a paste (or use a zester). To make the tapenade, in a bowl, combine the chopped olives, lemon zest, 1 TBS of olive oil, and as much of the garlic as you’d like. Season with salt and pepper to taste. Add sour cream and crumbled fetta to the risoni, asparagus and beans. Season with salt and pepper. Reheat for a couple of minutes if needed. Squeeze some lemon juice over the cooked chicken and slice. Divide risoni between plates. 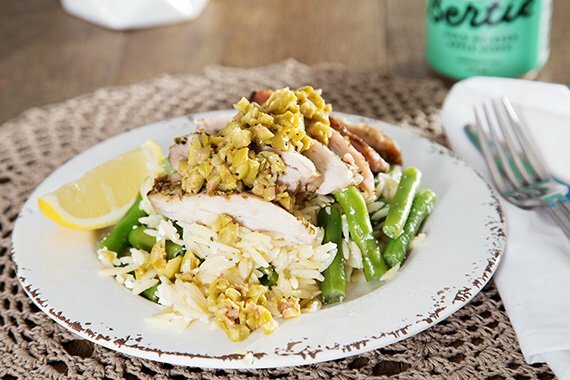 Top with sliced chicken and olive tapenade - Enjoy!